The only global settings to configure a DSLB farm are described below. Virtual IP. This is the virtual IP address for which the farm will be binded and accepting incoming connections in the load balancer. To make changes in these fields, ensure that the new virtual IP is not in use. In order to apply the changes the farm service will be restarted automatically. This couple of icons will let you restart (the small curved arrows) or start/stop the farm (the green triangle or square). 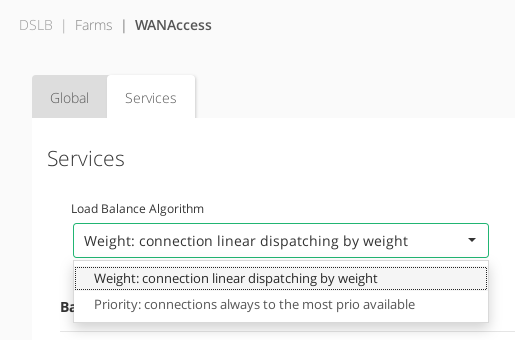 The service created for uplinks load balancing provides the following options to be configured in order to manage the data path and connections behavior. Load Balance Algorithm. This field specifies the load balancing algorithm to be used in order to determine the router to be used as backend. By default, weight algorithm will be the default selected algorithm. IP. The IP address of the given backend, in the case of DSLB will be the routers IP addresses. LOCAL INTERFACE. It’s the network interface for which the given router is connected to the load balancer. This section let you enable IPDS rules. The list shows different types of protection and a select box to enable them. For further information please go to the IPDS Black List. IPDS DoS and IPDS RBL are not enabled in DSLB farms.